Fry onions in a pressure cooker to golden and add ginger garlic paste. Add salt, khaskhas paste and coconut. Mix and continue frying. After 3-4 minutes, add garam masala and chili powder followed by water. Water should be as much as you desire in the curry. Too much watery curry loses its taste. Pressure cook to just upto the point of developing full pressure (first whistle) and take off heat. Your recipe looks delicious. 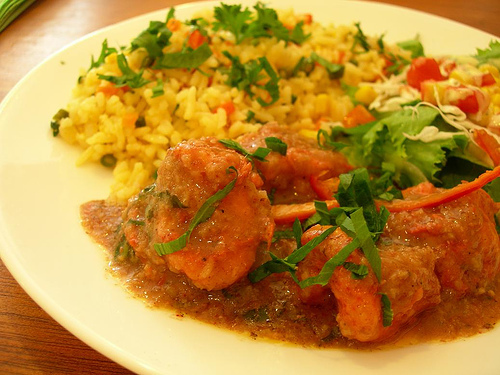 This dish can be better prepared in a kadai because the masala will stick better to the prawns. You can also add a little tamarind water before adding the prawns and the taste is very good. but it is not mentioned when to add the king prawns!!!!! The is simple to cook and sounds delicious.My question is can I use coconut milk instead of coconut powder? Do we really need to pressure cook the Prawns????? Normally Prawns dont take time to cook.